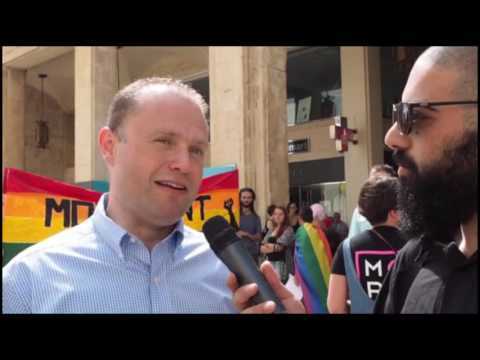 Malta's Pride March on the penultimate day of Malta Gay Pride Week 2016 is well underway with the march being the first in a list of three activities today. Valletta's Republic Street is currently home to colourful banners, costumes and party floats being led by two men driving big loud motorbikes brandishing the iconic rainbow flag, and a turnout of up to 1,000 people. Prime Minister Joseph Muscat as well as Opposition Leader Simon Busuttil were in attendance at the very beginning of the parade, as well as PN MP Claudette Buttigieg and Civil Liberties Minister, Helena Dalli. Meanwhile, independent MP, Marlene Farrugia posted the event banner on social media earlier this week saying that the new Democratic Party fully supports the event. Movement Graffiti also said in a statement earlier today that they will be attending and fully supporting the cause. Malta was pushed to the forefront of LGBTIQ rights in the EU with the Civil Unions Bill which was established 16 April 2014.